Marking the completion of a personal quest, I recently obtained and restored a 1935 Calvin. It became a quest because a long time ago I mis-identified a rectangular shaped watch for a Calvin and I ordered the incorrect crystal. I set the crystal aside and told myself, "Someday I will install this noble crystal in it's rightful case". 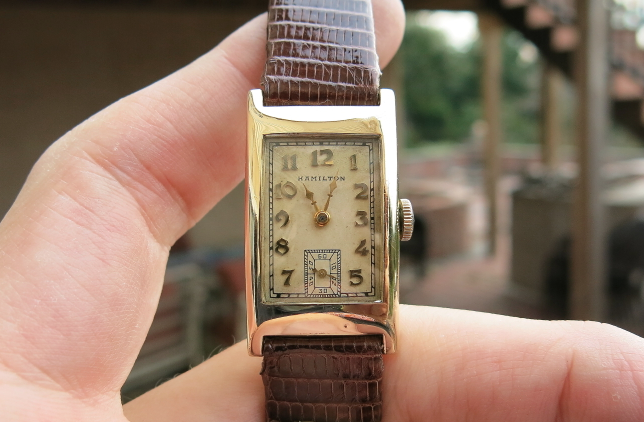 Now, the 1935 Calvin was only made for one year, so you don't come across one every day. I don't know how rare it really is but I can honestly say that I haven't seen another one come up for sale - meaning that I've been looking for one for a while and only happened to find this one recently. 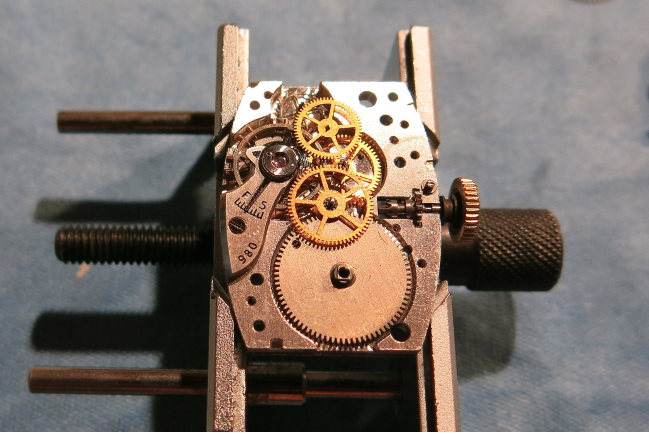 The Calvin was one of the very first models to use the 14/0 sized, 17 jewel 980 movements. 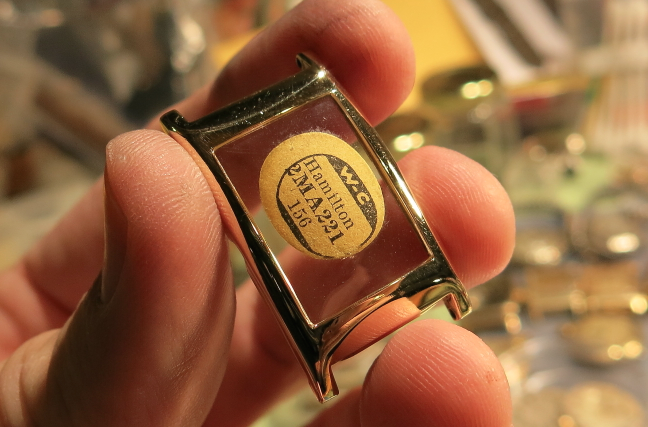 It came in a 14K gold filled case in yellow only. Two dial types were available... the AGN version (that I have) and the black enamel version. It was partnered with a ladies model called the Joan. Since I've only seen one, I can only say that mine seems to show trace amounts of wear to the ridge of the curved portion of the bezel, near the lugs. I can imagine that this arched area would likely show a lot of wear on other examples. 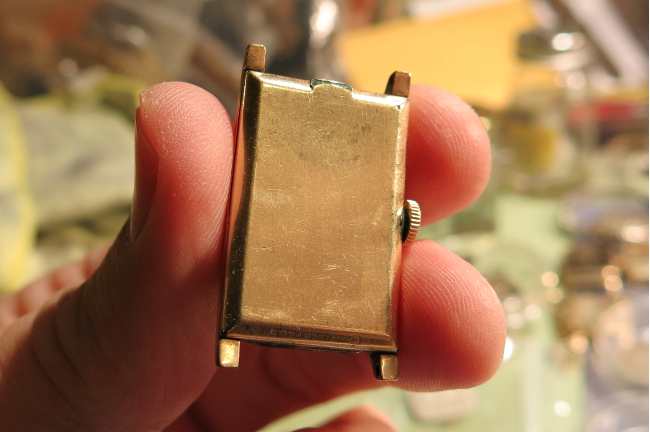 Mine also shows some wear to the lip of the case back - a very typical wear spot on these rectangular, tank-style cases. Here's a semi-step-by-step perspective on what I did to restore my Calvin. As received, the watch came on a gold-filled expansion bracelet. 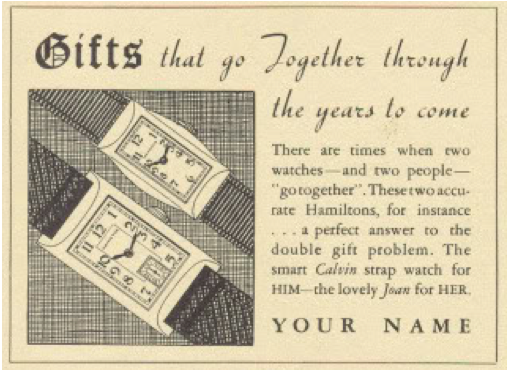 Very, very few watches back then used bracelets so I prefer to keep my watches on straps. The watch itself was dirty but not too bad. There's one small ding on the bottom of the bezel, just below the number 5. The case back is solid overall, just a hint of wear here and there. The glass crystal was heavily scratched and needs to be replaced. I prefer glass to plastic. Plastic can be polished out, but it also scratches more easily. The dial looks to be original. It's in excellent shape with a pleasing, parchment colored patina. I'll try to clean it up just a little bit - but not too much. The "solid diamond" hands don't match the catalog hands but they do have a matching second hand - very nice. 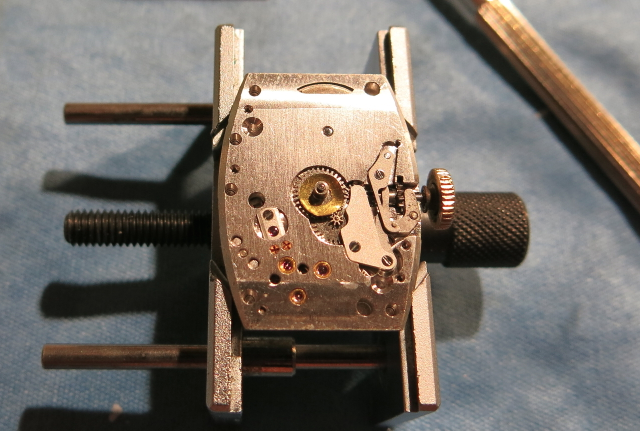 Spotting a re-dial is sometimes easy - as they can be poorly done. But sometimes an older, quality redial looks authentic. Preference is always for original but a nice redial can be fine too - it it looks nice. The back of this dial has no numbers inscribed and the appearance definitely supports the conclusion that this is an original dial. 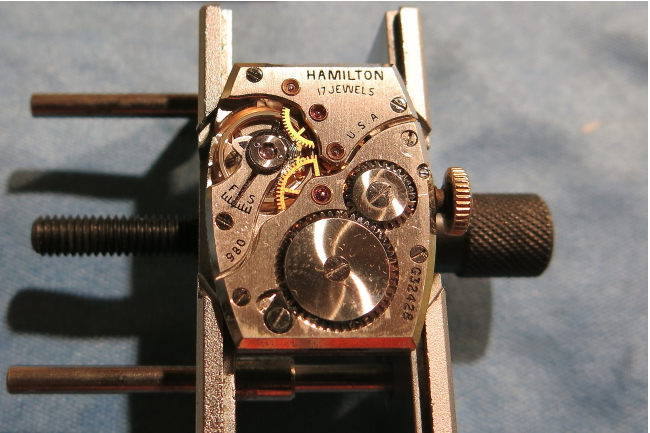 The earliest 14/0 movements have a split "set bridge" and "set lever yoke". These are the parts held by screws on the right side of the photo below. Later movements combine the two parts into a single piece. 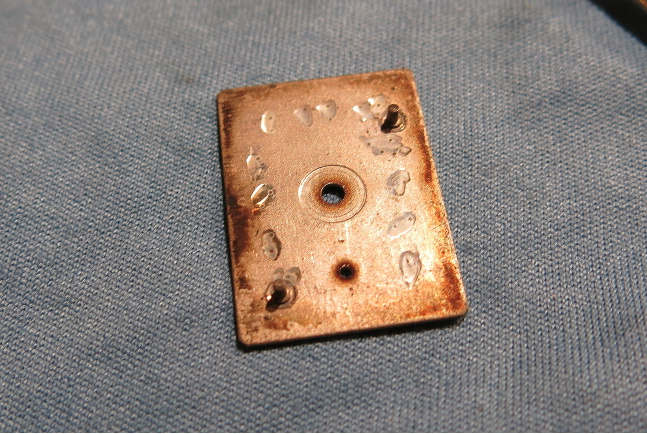 The gold washer in the photo below is called a "dial washer" and it goes between the "hour wheel" and the dial. The hour hand attaches to the hour wheel. Inside the hour wheel is the "cannon pinion", which the minute hand attaches to. Just below and to the right of the hour wheel is the "minute wheel". It has teeth on a larger diameter to engage the cannon pinion and teeth on a smaller diameter to engage the hour wheel. So, as the cannon pinion is turned by the center wheel of the watch, it turns the minute wheel and the minute wheel turns the hour wheel. Directly to the right of the hour wheel is the setting wheel - that also engages the minute wheel. When the set lever is moved to the setting position (by pulling the stem), the setting wheel drives the minute wheel and thus turns the minute and hour hands. Anyway, these parts need to be removed in order to pull the gears from the other side of the main plate. Here the hour wheel, setting wheel, etc. has been removed. 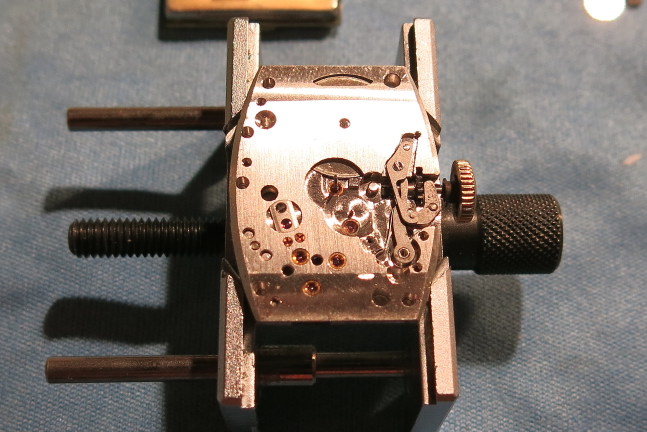 One the reverse, all of the power in the mainspring needs to be let out by "unwinding" the watch. 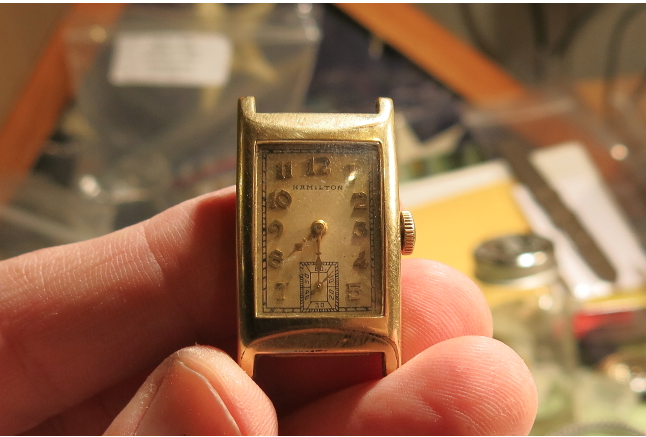 This watch was not working when I got it but after removing the hands and dial it started right up. You can see it is running in this shot (the balance is blurred). 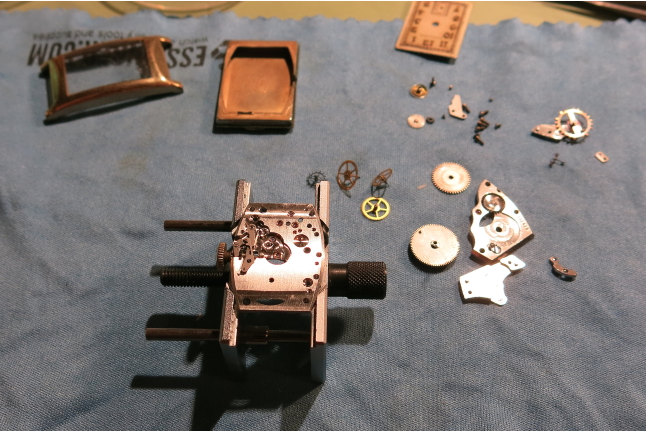 Once the mainspring power is let out the watch will stop. I was glad to see that the watch was running though, as it was a good sign that a cleaning was all this watch needs. If you're really thorough, you might look up the serial number of your watch movement to make sure they're made in the time frame of the model. 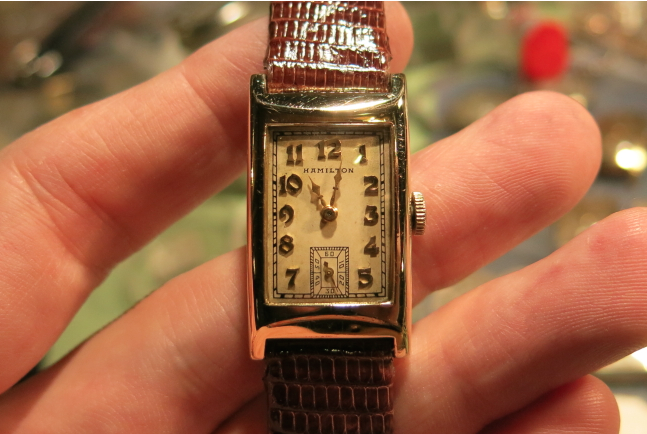 This movement number is G32428 - and that dates to being produced in 1935... a perfect match! Removing the screws that hold the mainspring bridge and the train bridge reveals the mainspring barrel and the various wheels that were beneath the bridges. They can all be safely removed and set aside for cleaning. Next off is the balance assembly - held in place by one screw. With that set aside all that is left is the pallet fork, held in place by it's bridge in the upper left of this shot. Just a couple of more things to come off the front and everything is ready to be cleaned. 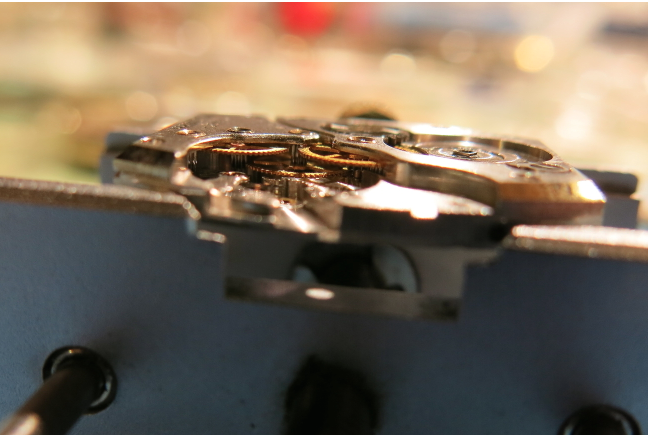 I always check the mainspring on these old movements. As you can see below, this one is "set" and doesn't have anywhere near the strength that it once had. It should splay out and even curve the other direction. 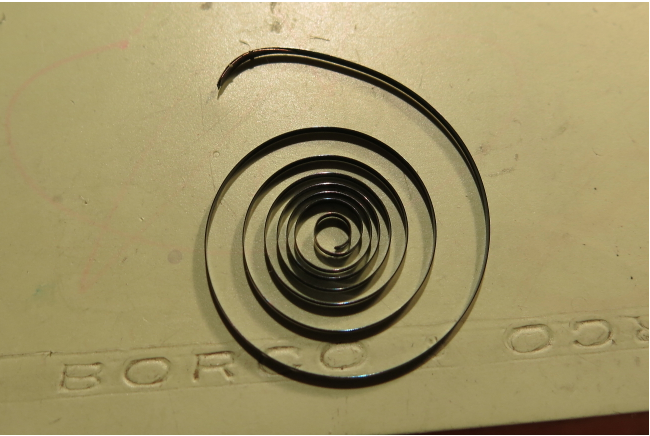 So this watch will get a fresh, white alloy spring in it's place. Here everything is clean and drying. You can see (sort of) the new mainspring is tucked in the barrel on the lower right of the shot. While everything dries, it's a good time to work on the case. Sometimes everything goes your way. 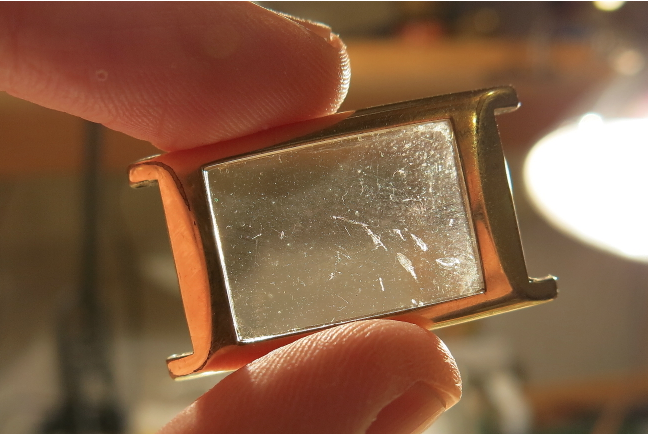 Today was a good day and the new glass crystal fit right into the freshly polished case without any shaping necessary. A little UV glue and this crystal will be ready for installation. 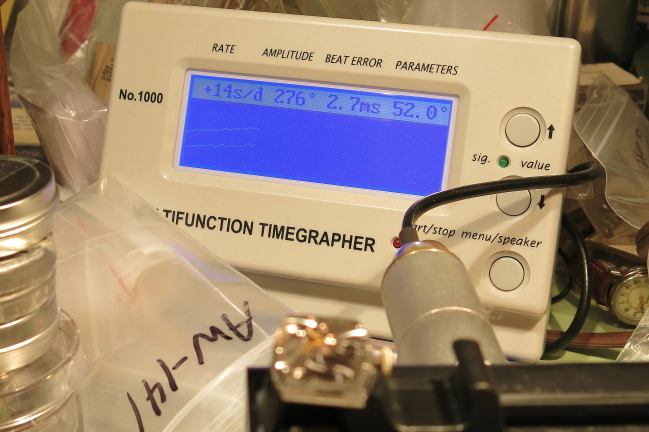 While the UV glue sets, I assembled the watch. 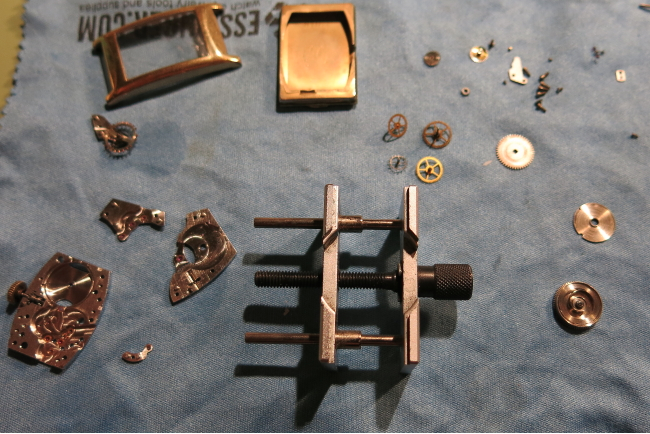 Re-assembly is basically the reverse of the photos above - except the balance goes on last. The hardest part of assembling a 980 movement is getting the escape wheel, fourth wheel and third wheel to all line up under the train bridge. I fiddle with them with a fine set of tweezers from this angle until they all line up and the bridge drops into place. Everything is lined up correctly in this shot. 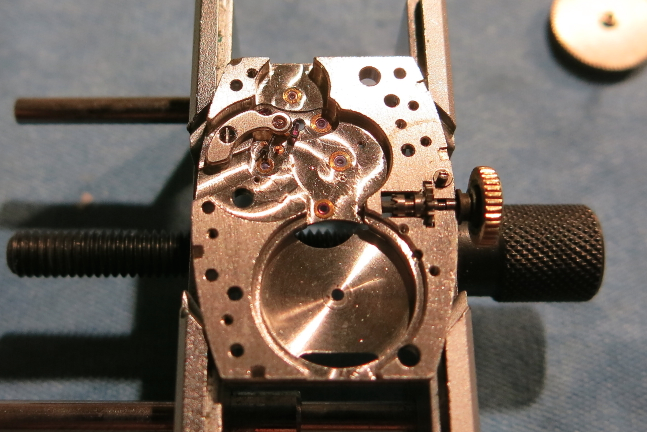 The large open space that allows me to see the gears is where the balance assembly will go. That's one reason why I put the balance on last. With the balance back on and the watch wound up, it goes on the watch timer. It's running 14 seconds per day fast right out of the chute. 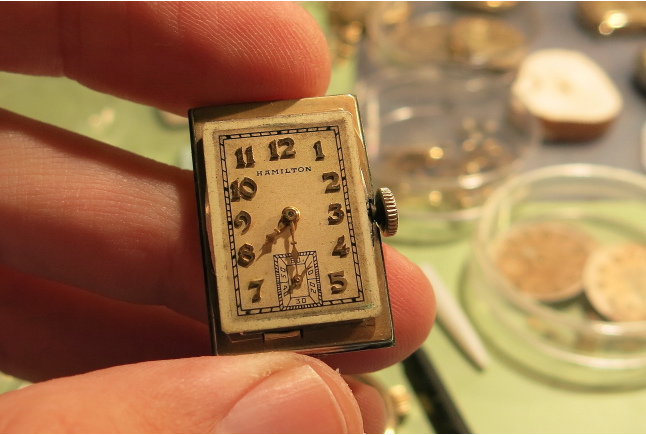 I could try to tweak it a little but 14 seconds per day is well within my tolerance for vintage watch accuracy. With the dial and hands reinstalled and the watch back in it's polished case... all that's needed is a nice lizard strap and this watch is complete. Here it is again with better lighting outside. I like this Calvin a lot - it was definitely worth the search and my Calvin-quest is now complete (but it would be nice to have an enamel version.... hmm). I have the enamel version of the Calvin. Your account of the restoration of your Calvin gives me renewed admiration for the men that made these watches and the men who keep them running. Thank you!